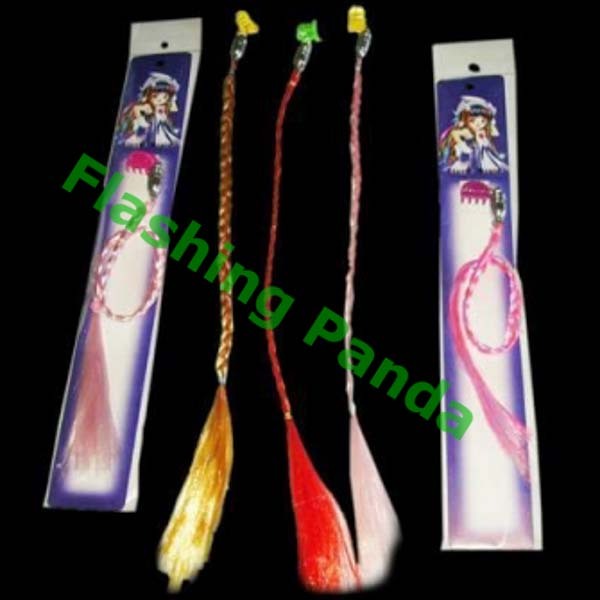 Amazing LED flashing tentacle noodle hair barrette clip into your hair, and make you the star of any party or concert! The 15" barrette comes with ribbons and has 7 super bright white LEDs flash in 3 modes. These will go well with our other flashing body jewelry, as well as our flashing barware and flashing toys! Turn on and off as desired with the simple push-button operation. Two lithium button-cell batteries are preinstalled and are replaceable. Now available in selected colors or assorted colors. Simple on/off switch, just turn the knob on the back to turn on and off as desired. 7 super bright white LEDs flash in 3 modes. Available in 5 cool colors - collect all five! Easy-snap hair clip to attach to your hair. Comes with two 3 volt CR-1616 Lithium batteries preinstalled!